Our new dynamic campaign has recently launched and our plans are for increased numbers within the server. Some units have expressed an interest into signing on to our event which takes place on Saturday's at 14:45 hrs EST. The current campaign is "Operation Typhoon" and deals with the German advance towards Moscow which commenced in early October, 1941. The mission is dynamic in nature and the front lines and available assets are factored according to mission results. It's a battle of Commanders positioning and choosing targets in addition to combat success and pilot survivability. The server currently has AI within the scenario for immersion purposes, but our plans are for the AI to be cut back in proportion to the number of interested human pilots we have on hand to take over AI assignments. Past missions have had a maximum of 10 to 12 players per side and although small in numbers have been very successful in immersion and excitement. First we would want to know if your unit is willing to fly both VVS and OKL. Next, we would ask those members that are interested in participating to join our site here so we can include them in the Combat Events calendar. In addition, we would try to keep their unit integrity, but the Commanders would be from SCG and they would augment as needed within the mission. That's not saying that they wouldn't be in charge of their own schwarm or element, but that they would be given mission orders from SCG Commanders for Operation Typhoon, VVS/Riksen and OKL/CorZero. They would be required to report their mission stats post mission to the Element Leader who would submit it to our official mission results for tabulation so the dynamic map can shift and be updated for the next mission. And lastly, participation numbers would start off small as we increase the numbers within the server for smooth game play with the best participation. This would include gradually cutting back AI aircraft to be replaced by human players as the event moves forward from week to week. Can your unit fly Allies? 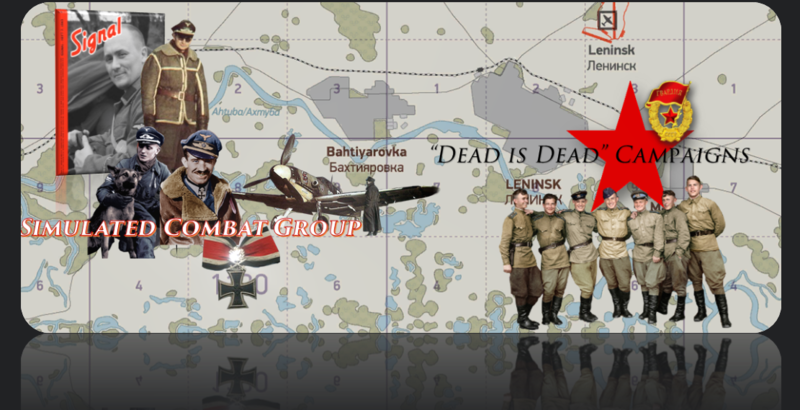 Do you understand that currently overall Allied and Axis Commander positions will be within SCG? This is a "Dead is Dead" campaign environment. Pilot KIA's after the first 40 minutes of the mission will result in exclusion from the remainder of the mission. Missions last approximately 150 minutes if needed. Understand? Your interest is most appreciated!